I responded that the ball costs $0.05. The student seemed disappointed that I had solved the puzzle using math of all things. He objected that I shouldn’t have thought about it but just answered with the first thing that came to my mind (…a little glimpse into the thought process of my students). I thought that couldn’t possibly be accurate…but it is. Thank you internet. The research was published online in the Journal of Experimental Psychology: General. The study from the Harvard University Psychology Department was conducted by Shenhav, a doctoral student; post-doctoral fellow David Rand, PhD; and associate professor Joshua Greene, PhD. In the first part of the study, 882 U.S. adults, with a mean age of 33 and consisting of 64 percent women, completed online surveys about their belief in God before taking a cognitive reflection test. The test had three math problems with incorrect answers that seemed intuitive (like the problem above which has an “intuitive” answer of $0.10)…Participants who had more incorrect answers showed a greater reliance on intuition than reflection in their thinking style. Participants who gave intuitive answers to all three problems were 1 ½ times as likely to report they were convinced of God’s existence as those who answered all of the questions correctly. First of all, there is clearly a problem in defining intuitive (or at least measuring intuition) as answering incorrectly to a series of math questions. Intuition, as defined by dicitonary.com: direct perception of truth, fact, etc., independent of any reasoning process (emphasis added). I am uncertain then how answering incorrectly shows a direct perception of truth. I get the impression that the real claim of this study is that people who respond without thinking tend to accept the idea of religion more than those who analyze information that is presented to them. For some people this is the “religious” way of thinking: just believe, don’t analyze. 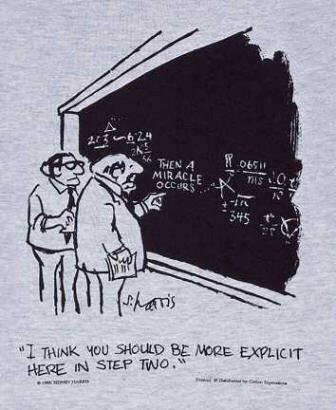 What makes the comic humorous is that this is an obviously flawed approach to mathematics. I contend is an equally flawed approach to faith. In some cases, because the American public is not terribly theologically literate, they hold contradictory views because they haven’t thought deeply, or been taught deeply, about their faith tradition. Not examining one’s religious beliefs tends to lead toward contradictory or false beliefs. Scripture makes this point itself. The book of Romans clearly explains how we are created with an intuition toward the things of God, but that intuition becomes marred by sin. What we need is a renewal of this intuition, a renewal of our minds, not for the purpose of blind acceptance but for testing and approving the will of God. For the wrath of God is revealed from heaven against all ungodliness and unrighteousness of men who suppress the truth in unrighteousness, because that which is known about God is evident within them; for God made it evident to them. For since the creation of the world His invisible attributes, His eternal power and divine nature, have been clearly seen, being understood through what has been made, so that they are without excuse. For even though they knew God, they did not honor Him as God or give thanks, but they became futile in their speculations, and their foolish heart was darkened. Professing to be wise, they became fools, and exchanged the glory of the incorruptible God for an image in the form of corruptible man and of birds and four-footed animals and crawling creatures (Romans 1:18-23). Do not be conformed to this present world, but be transformed by the renewing of your mind, so that you may test and approve what is the will of God– what is good and well-pleasing and perfect (Romans 12:2). The brothers sent Paul and Silas off to Berea at once, during the night. When they arrived, they went to the Jewish synagogue. These Jews were more open-minded than those in Thessalonica, for they eagerly received the message, examining the scriptures carefully every day to see if these things were so. Therefore many of them believed, along with quite a few prominent Greek women and men (Acts 17:10-12). As a math teacher I feel that I am charged with teaching students to think well and reason correctly. As a theologian I feel that I am charged with teaching believers to think well and reason correctly. We need thinkers. We need teachers of thinkers.